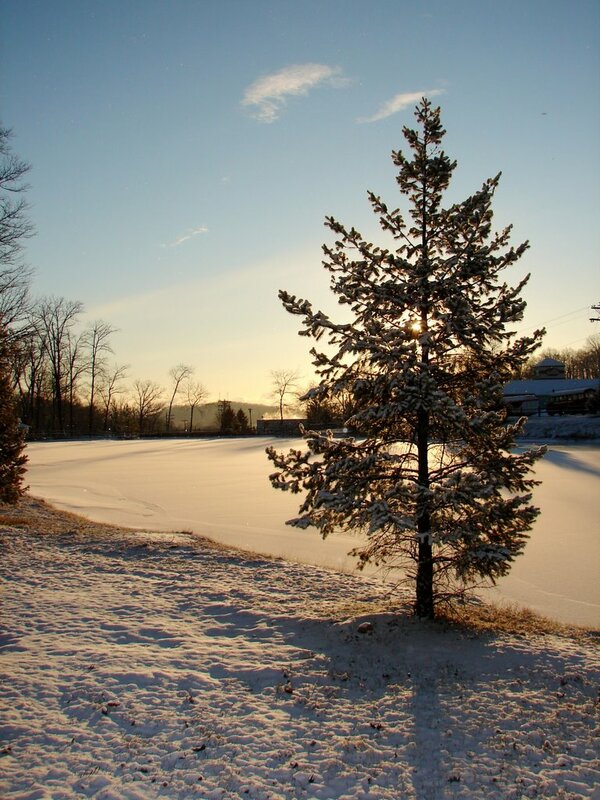 It’s starting to feel like late winter here at Roundtop. 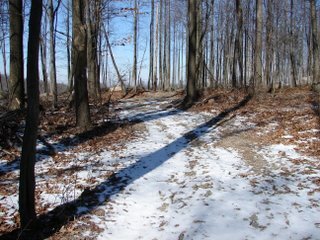 The snow is starting to melt in spots that get direct sunlight. 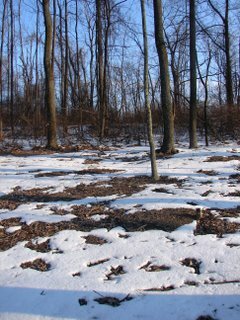 Where the sunlight is filtered, or blocked by trees, the snow cover is still complete. I am starting to take slightly longer walks again with the dogs. There is still too much ice and snow for the long walks of summer, but we are now able to get out and around a little bit more. I’m sure the dogs appreciate that as much as I do. I must be one of the few people who can get “cabin fever” when I’m outside but can’t go for long walks. Perhaps “driveway fever” or “lane fever” is a more accurate description than cabin fever. The temperature for this time of year is near normal, though on the underside of normal. The wild swings of 20 degrees above and followed by days of 20 degrees below average have disappeared. As a result, the weather feels calmer right now than it’s been for months, and that brings me a sense of relief, as though I’d been holding my breath without realizing it. 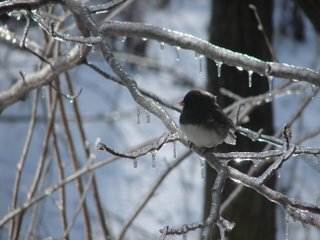 I know I said I wouldn't post any more ice storm photos but when I was going through my photos I found this one, and I couldn't resist it. How about that hairdo on this blue jay?? Spring is coming. I know this because I heard the first killdeer this morning. I think I will call this is the first official sign of the oncoming season. I suppose I could count cardinals’ singing as a “sign,” but cardinals will sometimes sing on sunny days in January too, so I don’t count them. I think cardinals start looking for spring as soon as the first snow hits the ground, and their singing is more a sign of optimism and anticipation than of impending spring. Now that the end of February is near, I’m starting to look through my 2007 February bird list that I keep of sightings around my Roundtop cabin and compare it with lists from previous years. The 2007 version of my list has so far recorded slightly fewer species than average, though I can’t say I find this surprising. My February bird lists are very tied to the weather of each year. 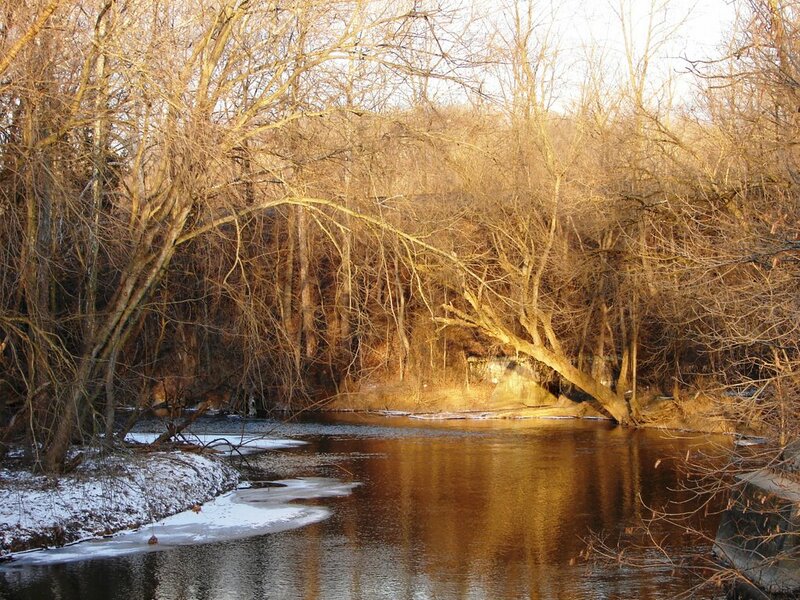 When February is mild or at least not snow-covered, my list is larger. For example, winter robin sightings are missing from my 2007 list. I think the ice drove them south or at least away from here. As soon as the ground is mostly free of snow and especially ice, I will see them. I haven’t seen flickers this winter either. These birds don’t really migrate, but I’ve noticed that they leave the mountain and head downhill to more sheltered areas during winter. As soon as the weather warms a few degrees they will show up and start drumming territory on the electrical transformers again. Goldfinches have been in especially short supply here this winter. I haven’t heard anyone one else mention this, so it’s likely just a local variation. Another oddity for my February sightings, or the lack thereof, are sparrows. I typically have white-throated, song, maybe fox or white-crowned sparrows in some numbers. Not this year. Sightings of any sparrow other than the junco have been few and far between so far. Yesterday I had one sighting of one song sparrow. Each year of birding and tracking the species I see brings its own pattern of unusual sightings, late sightings, early sightings, etc. Each year has its own oddities and commonalities. In that, at least, this year is no different. It’s why I enjoy it so much. Another week, another snow/ice storm. This one wasn’t nearly as bad as last week’s storm. The ice isn’t inches thick, which made the biggest difference. This was a busy weekend on the mountain. One of the local boy scout troops did their annual winter camping requirement in the paintball area at Roundtop. I could sit on my bed and see their campfires on both Friday and Saturday nights. I’m not used to having that many people so close to the cabin, but as far as I could see it all came off without a hitch. Except that Baby Dog barked whenever she heard a voice from that area. She isn’t used to that much activity so nearby either. It took six times but I finally got to to see the Scott's oriole that has been hanging out eating fruit in a subdivision near me. It's not a great picture. I don't care! I got to see the bird, so I'm happy. I headed out early on Saturday morning, not so much because I expected to see the bird that early but because I expected hundreds of people to show up to look for it, and I didn't want to park a mile away. I arrived around 7:30 a.m. and was able to park closer than I expected. As I was walking towards the house I saw perhaps a dozen people, binos up, all looking in the same direction. So I figured they were on the bird, which they were. So after 5 times of not seeing the bird at all, this time I walked right up to the spot where the others were, raised my binos and spotted the oriole. 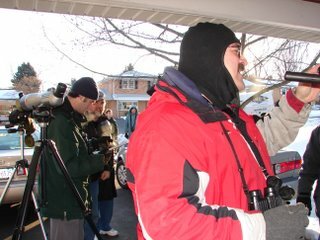 The second photo is just a few of the other early morning birds who showed up to see this first Pennsylvania record of this bird. Until Saturday morning, the homeowner's logbook had tallied 60 people. How many more they got on Saturday I have no idea. My joy at finding this bird and seeing it in Pennsylvania is tempered by the idea that the prognosis for this bird is rather grim. If it stays in the region, it will never find a mate. The poor thing will have to find its way back to Texas, New Mexico or Arizona to find one. And I had more snow today, which can't make a bird from the warm southwest very happy. The homeowner has been diligent about feeding this bird orange slices (and also strawberries), which is keeping it from starving in this cold weather. I hope it is able to withstand today's snow, as anything that has been such a joy for the people seeing it should be able to have a little happiness of its own, as well. Sorry for the light posting this week. And for no photo today. 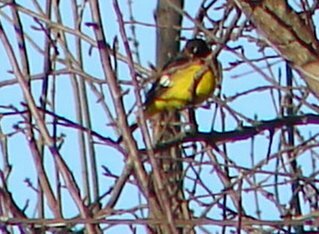 My extra time has been spent about 6 miles from the cabin in a nice, mature subdivision trying to see a Scott’s oriole. For those of you who are birders, yes, you read that correctly. 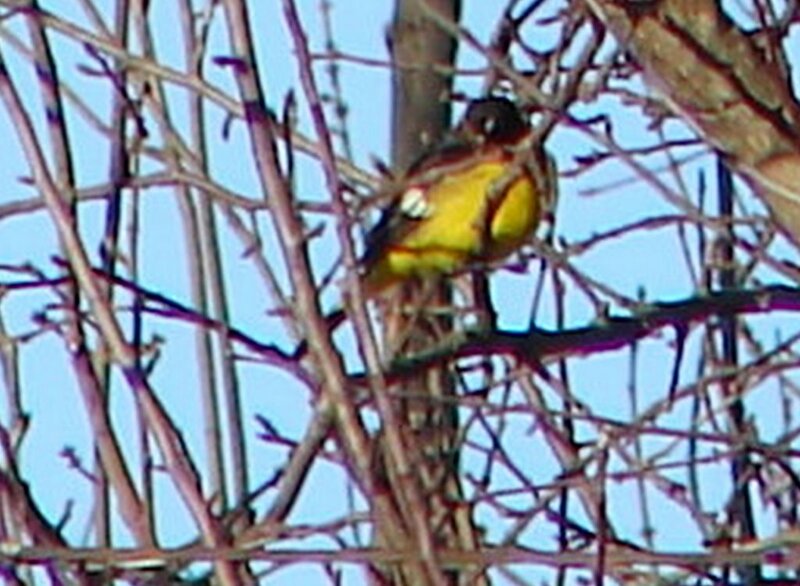 A Scott’s oriole. For those of you who aren’t birders, a Scott’s oriole is a beautiful yellow and black oriole, unlike our beautiful local Baltimore orioles that are orange and black. What makes the Scott’s appearance in a nearby subdivision so remarkable is that this bird is only resident to a small area of the far southwestern U.S. And it supposedly doesn’t migrate. This is the first time it’s ever been in Pennsylvania, and apparently only the third time it’s been east of the Mississippi. 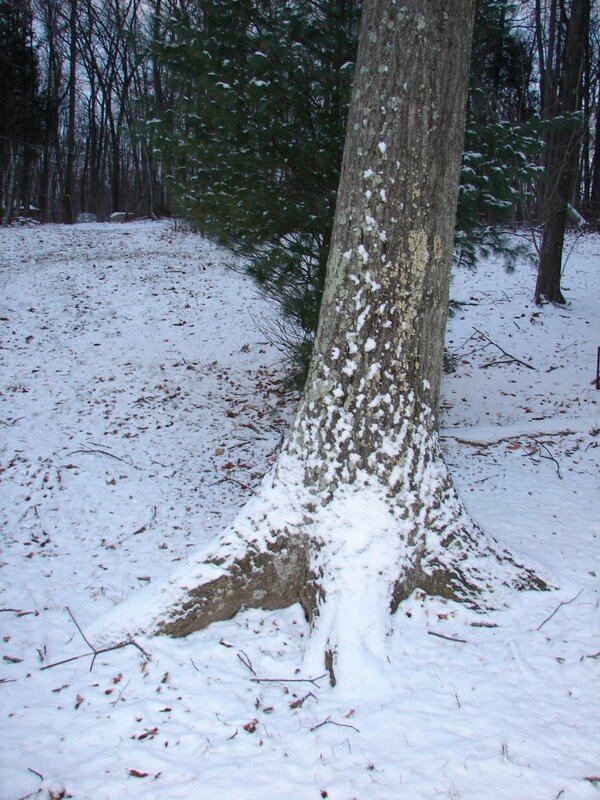 So what is it doing in the middle of winter (such as it is) in Pennsylvania? That’s the $64,000 question. Who knows? Anyway, the thing is here. In some ways, I am not surprised that I haven’t seen it, though I am disappointed. I’m not surprised because the sightings of the bird have mostly been in the mid-morning, a few in the mid-afternoon. My attempts to see the bird have been in the early morning before work and the late afternoon after work. I’m also not surprised because my track record at seeing rare birds is pretty dismal. It’s one of the reasons I first gave up chasing. But when a bird this good is only half a mile off my normal commute path, I just can’t let it go. Unlike Pennsylvania’s megabirders, who are either retired or can apparently forego work at the drop of a hat to go chasing something interesting, I am restricted to birding before and/or after work or on weekends. I am not alone. I’ve made 5 trips or passes by the area where the bird hangs out in the past 3 days. I’ve met some very nice folks, mostly young men, who are also searching for this bird. The local residents have been extrememely nice about having people milling around their carports, though I think they are a bit stunned by the excitement. They haven't seen what is likely to happen tomorrow when most birders have off work and are likely to try for the bird. It will make the crowds from Saturday morning garage sales look like nothing. I will try again tonight to see the bird. And probably on Saturday (if the bird is spotted today) when I will at least be able to be present during the time of day when it is most likely to be seen. But I’m still not optimistic. My history of not-seeing rare birds is simply too strong. But i won't be able to resist showing up. Yesterday the temperature rose well above freezing, and the ice started to melt. 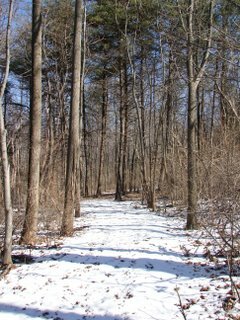 For me, that meant I could actually get beyond the icy surrounds of the cabin and explore the edges of the woods a little. 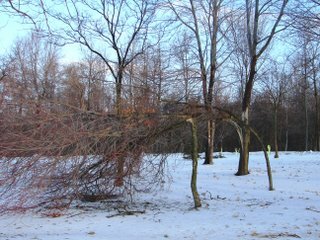 As you can see from this early morning photo, here are two trees where the weight of the ice-covered branches ended up splitting the trees. I also lost a juniper bush or tree that came with the cabin. I'm sure I'll find many more downed trees when I can finally get deeper into the woods. Nonetheless, I am glad to see this ice start to melt. I love snow, but ice and I don't mix well. Dog and I almost had a half-decent walk this morning, marred slightly by a fall I took on a small patch of ice that I didn't see in the pre-dawn gloom. Dog rushed over to make sure I was okay (I was), and licked my face, which was thoughtful but didn't do much to help me get to my feet again. With the melting ice comes mud, which ranks perhaps one step below (or is that above?) ice on the list of things I don't care for. Anyway, ice is #1 on my list of things I don't like, but mud is #2. I think I'd put wind at #3 (high winds in the forest can make for a scary situation). Mud ranks especially high on my annoyance meter, though it doesn't come with the danger of ice and wind. Mud and ice together are the worst, which is what I have at the moment. Sometimes the joys of cabin life are a bit dimmed by the weather, but I still wouldn't trade it for anythhing. Dog loves the snow, though he usually manages, as here, to tangle himself up when he's outside playing in it. I think it's because he's so excited by the snow that he doesn't pay attention to where he is and what's happening around him until he's completely tangled and immobile. Such was the case when I took this picture. He has that surprised expression, as though to say, "how did *this* happen?" If I was off work today, which I'm not, I would attempt to be watching hawks today. I have found that hawks will migrate, or at least move northward, on the first warm day of February. And since it's supposed to reach 40 degrees today and because the wind, such as it is, is vaguely from the south, I expect hawks will be on the move. I have already seen an American kestrel sitting on its preferred wire overlooking the nearby orchard. 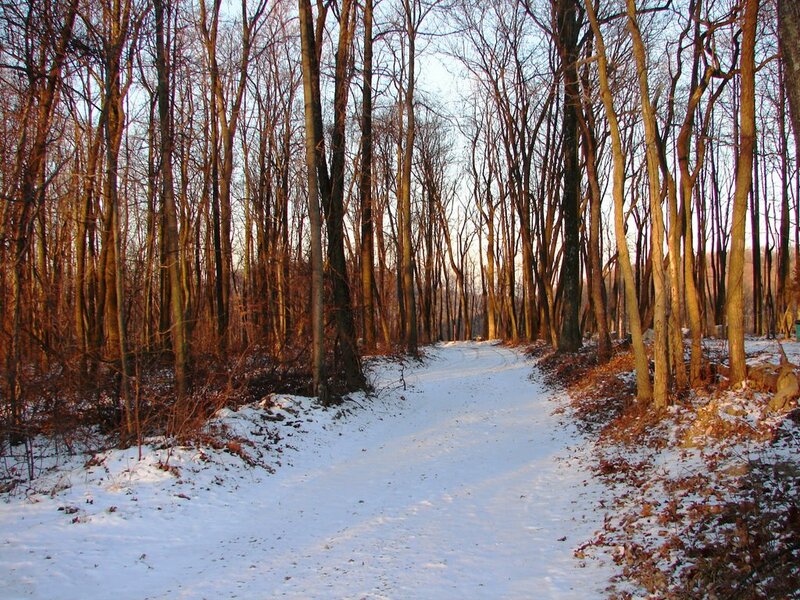 And, the local redtails have been spotted hunting and soaring over the woods at Roundtop. Hawk migration won't be in full force until mid-late March, and broadwings won't peak until the 3rd week of April or so, but that won't stop a few hardy souls from moving today. Take a look at this poor little junco, surrounded by icy branches. 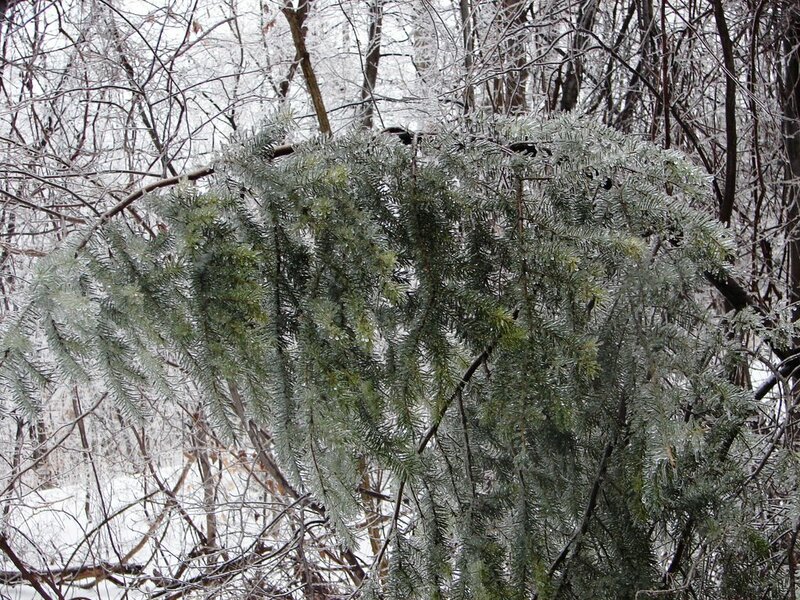 This gives you a small look at the kind of ice that I had around the cabin late last week. My father, who's 81, said he'd never seen such ice in his entire life. I know I've never seen anything like it. I am finally "out" but not yet parking up at the cabin. I am currently parking below the ice line that still cuts across the mountain, so I am walking up to the cabin, which makes things like grocery shopping and trips to/from the laundromat kind of interesting (and long). I didn't get the car dug out until Thursday afternoon, and even so I needed the help of three strong men to push me over the ice. The car looked as though I'd driven it into a pond and let it freeze there. I had to pour hot water on the doors to get in, and it took 3-4 hours with the heater and defroster on high to completely cle an it off. The birds cleaned me out of bird seed, necessitating a trip for seed (and carrying the 30-lb bag of seed back up to the cabin). I was glad to see a Carolina wren at the feeders throughout the storm. These little things roost in holes at the base of trees. After a 2-foot snowstorm in the '90's, all the local Carolina wrens perished. I was afraid this ice would seal the little thing into whatever location it roosted in, but wherever it's roosting, it survived. I'll leave you with one last ice photo, and then I hope I won't have to mention it again for a while. I'm kind of sick of ice at the moment. Boy, I have never seen such ice in my life! Four inches of solid ice. The car looked as though I'd driven it into a lake and let it freeze there. Apparently, the rain soaked through the several inches of powdery snow and just congealed on the ground. I spent three hours getting the car out and de-iced this morning, but I still can't drive anywhere. The lane has been plowed but the cinder truck hasn't been by yet. In another words, it's a mess. 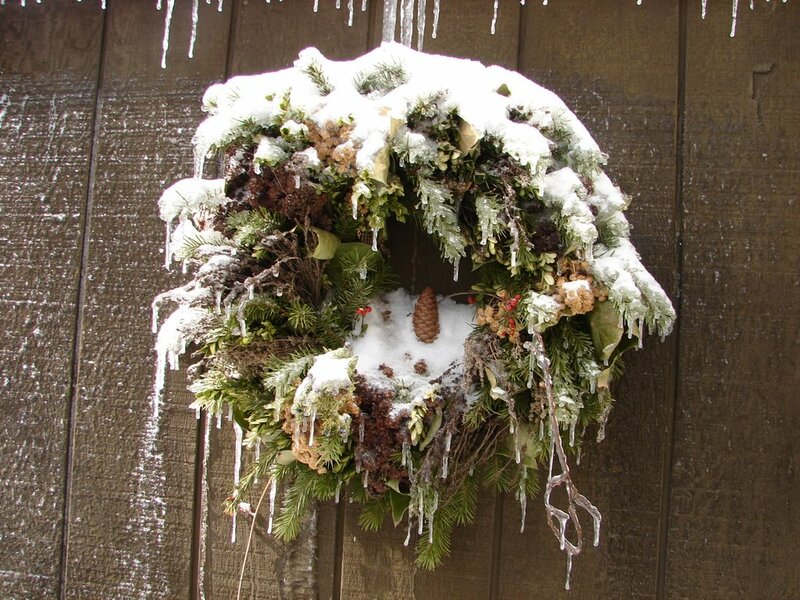 My back door has frozen shut, and since it's only 13 degrees right now, it's unlikely I will get it open today. The good news is that the wind is much diminished, though at this temperature any wind is stronger than I'd like. Because I can no longer get out my back door, I've abandoned the bird feeder out there. Instead, I am just tossing the seed out onto this concret snow/ice mix by the front door. It took the birds less time to find the new "feeder" location than it took for me to walk from the back to the front of the cabin. 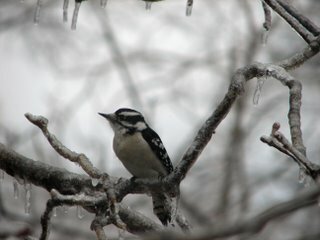 My photo today is of a downy woodpecker surrounded by icy twigs. Have you ever seen it rain when it's 17 degrees outside? Neither had I--until last night. My photo today is of a small pine tree that's bowed over from the accumulation of ice on it. 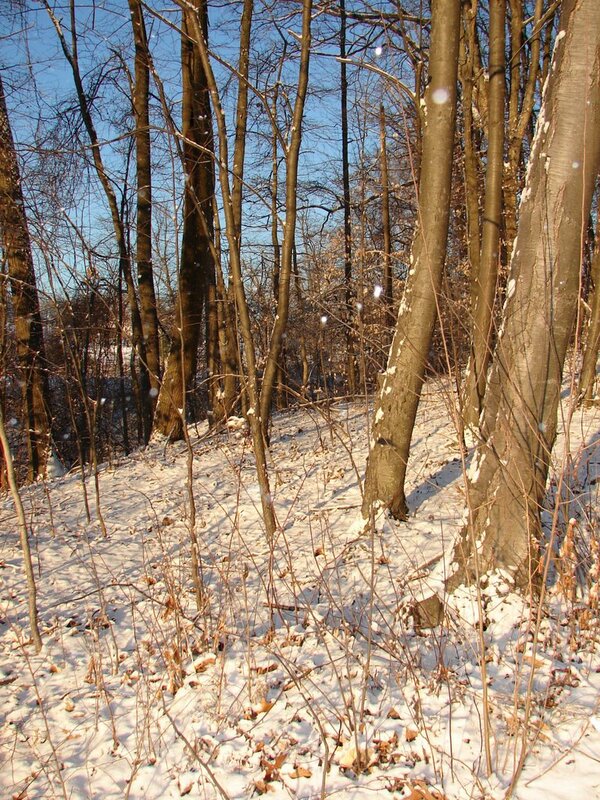 That's how the whole forest looks right now. Yesterday, the snow arrived as predicted and continued as expected until I had about 5 inches or so. Then it started to rain. I was outside with Baby Dog when that happened. It felt like lots of bee stings on my face. Overnight, I didn't get much sleep. The sound of ice pelting the windows was loud. Occasionally, I'd hear a tree limb break and crash to the ground, once or twice hitting the roof as it did so. That was usually enough to set the dogs to barking. This morning, everything is coated with ice. What's scary is that later today the wind will rise, and all this ice will come crashing off the trees, and the woods will be filled with flying ice daggers. 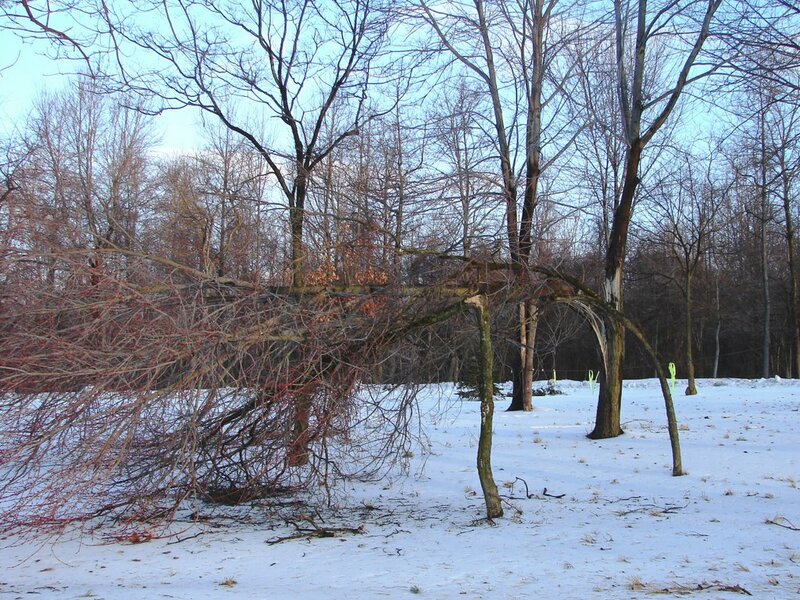 Or, the trees will break from the weight of the ice. If that happens, it's almost inevitable that something will fall on a power line. Then, I'll be out of power. But for now, I'm still here! No, I didn't take this photo this morning. New snow has already started to fall this morning, with storm predictions ranging anywhere between 6-12 or even 16 inches. I didn't take a new photo this morning as I left for work while it was still dark, with the idea that I can then leave work early and get home this afternoon before so much snow has fallen as to make the drive home difficult (And, truth be told, to have some time to shovel/run dogs/play in the snow before it gets dark). Up until now, this area has had less snow than has ever been recorded to this point in the year. 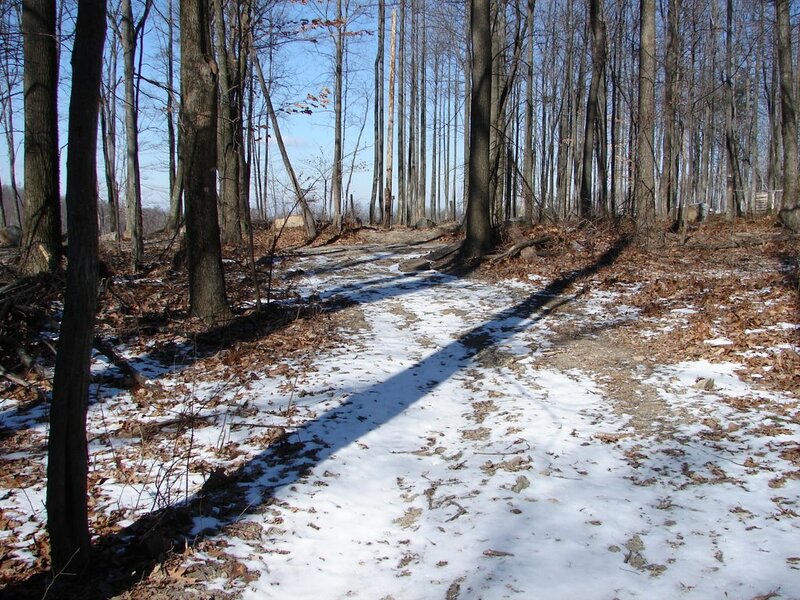 For late December and the first half of January, it was simply too warm to snow. I recorded less than 2" of snow so far this year, the city even less than that. The previous least amount for January was 8", so this year didn't just break that record, it shattered it. Since then, the weather has been more than cold enough to snow, but no storms have come through to drop any. 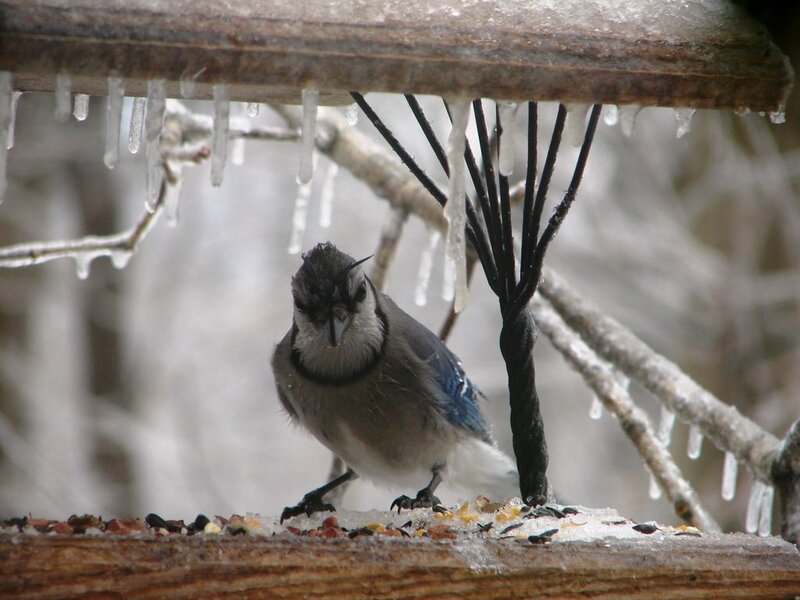 This morning, I filled the bird feeders with extra seed as I expect the snow will bring a feeding frenzy of birds. I'll be surprised if the feed now in the feeders lasts past noontime. With luck, I will be home by then to refill it. I haven't had any exotic feeder birds this year, or even any semi-exotic feeder birds, but my regular birds are as demanding of their expensive blend of seed as any pampered pooch. The tufted titmice are especially fun to watch. At least one of them has a preference for peanuts in the shell (which I originally got because the blue jays prefer them). This titmouse will carefully select the biggest double-peanut it can find in the feeder and fly away with it. The peanut shell alone is the same size as the titmouse's head, but that doesn't deter it. Winter temperatures finally arrived several weeks ago. Now, the winter snow is finally catching up, too. Ah, the weekend! I finally had the time and daylight for a walk in the woods. It was chilly, but no longer frigid. The wind was diminished since earlier in the week when it pummeled me with its brute force. In the weekend’s sunlight, the breeze constantly reminded me of its presence but didn’t leave me feeling battered. 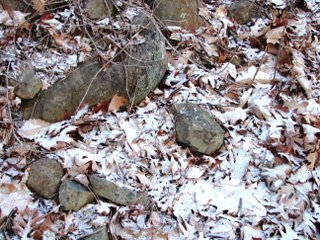 Dog and I explored the edges of the forest, stopping to try and decipher tracks of animals that had gone before us. This was complicated by the age of the snowy tracks, which were starting to look a lot alike. We went fairly early in the morning, after dawn but before the skiers were out in force. Dog thinks skiers are Things That Should Be Herded, so it’s better for all of us if I don’t take him along when he might be distracted by too many of them, even if they are in the distance. 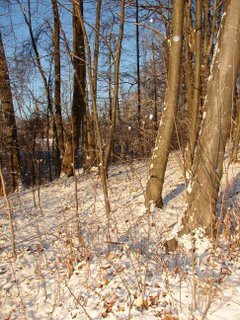 On a winter’s morning, the forest is a quiet place. We didn’t walk near open water, where we might have seen birds. We didn’t walk along brushy edges, where we might have seen the fox or one of the scolding squirresls. Instead, we walked among the miles of slumbering trees, where we occasionally had a view but mostly we had trees. That was more than good enough for Dog, whose daily rambles have been shortened recently by the cold, the wind, and the early darkness. And it was more than good enough for me, who has been feeling a bit deprived of the outdoors, as well. In a way, feeling deprived of the outdoors when I live in the forest sounds a bit ridiculous. But seeing the forest is not the same as being out in it, even when that forest comes right up to the cabin’s doors. 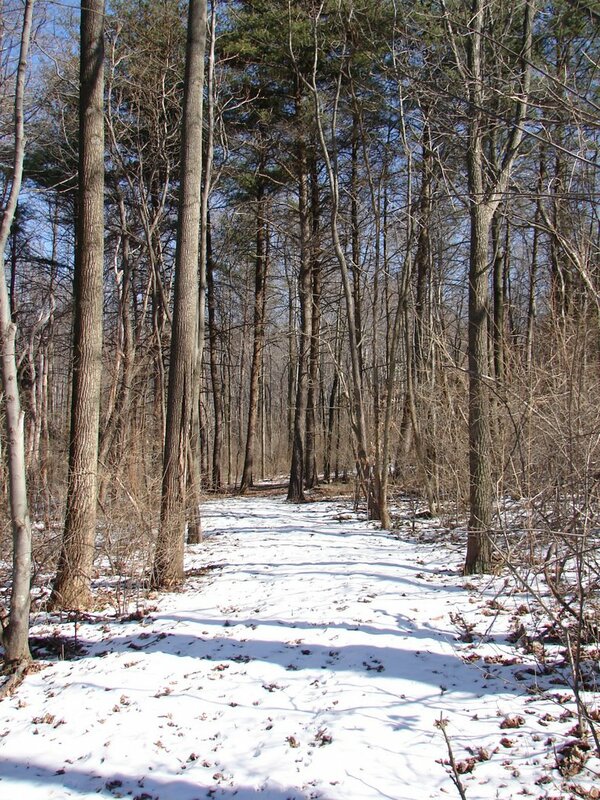 In the winter it is only on the weekends when I can really get out into the forest to explore. True, I could stumble around the forest in the dark (and I have done that), but that can’t begin to compete with a sunny weekend ramble. Even a short ramble through the woods rejuvenates me and helps ready me for the week ahead. We didn’t see anything exotic. We didn’t do anything extreme. It was wonderful. 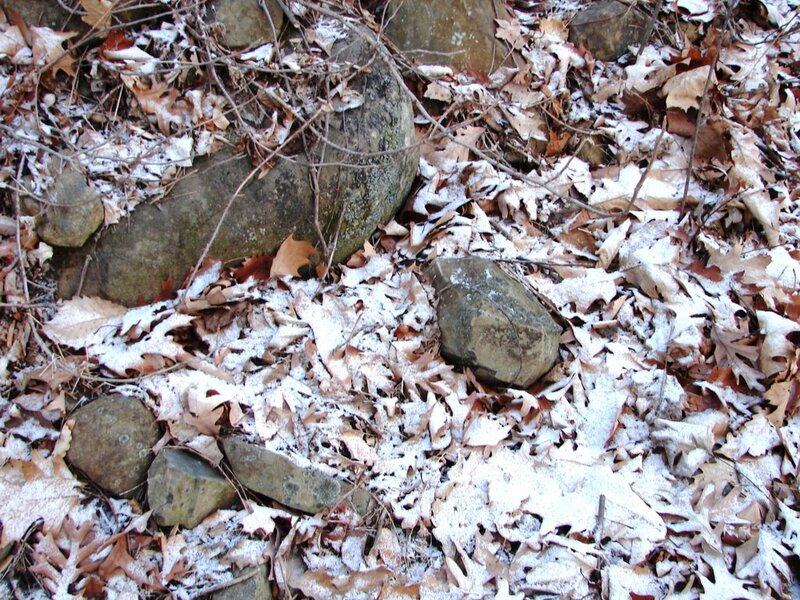 I didn’t take this photo on Roundtop mountain, though I did take it this morning. For the past few days on my way to work I’ve been crossing the Yellow Breeches Creek at Bowmansdale just as the morning’s first light was striking this cottonwood tree. For whatever reason, until this morning I haven’t been able to stop and try to capture the shot. Down off the mountain, there isn’t enough snow to call it a covering. 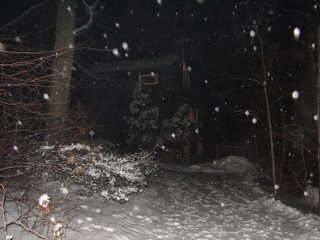 Up on the mountain, I only have an inch of snow on the ground, but it does cover pretty much everything. The weather continues to moderate, if slowly. This morning’s temperature was 14°, which was Monday’s high temperature. By the time the weekend is over, some areas may reach the freezing mark. I am just hoping that I can stand in the sun for a few minutes sometime this weekend, preferably without feeling any wind. Oh, and the poor dogs need a decent run, too. My photo this morning is of an old-two track road that I pass each morning as I’m heading out from my cabin and off to work. The road heads west, down off the mountain and into the valley between Roundtop and the mountains in the distance. 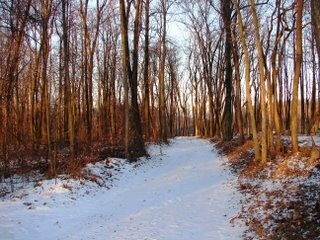 It is a trail I often hike, and the morning light tempted me again this morning, though the need to continue on to work (and the chill wind) kept me from yielding. A stream runs through the valley, which is blessedly forested, with no access to it other than by foot or perhaps mountain bikes. No roads, except for this one, cut through it until you reach the base of the next mountain over (here shadowed behind the closer trees). And beyond that road are no others until you reach the far side of the mountains. There, farmlands and houses replace the forest. But from here to there, the forest is still a forest—untrimmed, unmanaged and wonderfully unkempt. It lures me down into it, again and again. Even now, as I look at the photo, I am drawn to it, as surely as the sirens of myth drew sailors. How is it that I can be so entranced by what lies further along this path, when so many others see only timber or potential housing lots or perhaps, simply nothing beautiful or interesting about it? Am I just a dinosaur in this modern world? The rest of humanity, perhaps, has moved on, while I am left behind, trying to live a life that others willingly abandon. I am the like the deer in a development’s cul-de-sac, maybe, trying to eke out a living on backyard grass where once a field stretched before me. Perhaps I am the last bear at a garbage can, where once I found honey in a tree. Perhaps I am a wolf, long gone from these woods, howling at the moon. 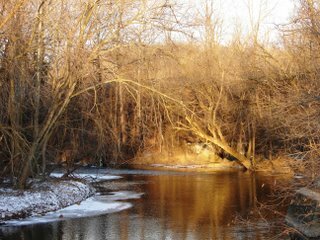 It was a balmy 11° degrees this morning, warm enough that the water pipes didn’t freeze again, warm enough that the car felt like a car again instead of a stiff old lady, warm enough that the dogs got a bit of an actual walk. In other words, it is a beautiful morning. With below zero temperatures and a 20-25 mp wind, my water pipes froze twice on Monday. This happened despite keeping the faucets dripping and with that electric tape around the pipes. So I am now keeping the light on in the basement and the taps are closer to running than dripping. This seems to have helped, though the diminishing of that wind and the warmer temperatures may well have been the biggest part of the improvement. I came home to the sound of no water dripping on Monday after work and then spent the next half an hour or so in the basement with my trusty hairdryer before the pipes opened up again. So when I went to bed on Monday night, the faucets were dripping even more than before, and the basement light was on, in the hope that would create at least a little warmth down there. I captured as much of the dripping water as I could—hating to waste it and not daring to turn them off again. All the plants got a good watering. The dog bowls were filled to the brims. I filled water jugs and bottles. I woke up around 1:30 a.m. to the sound of no dripping faucets again. 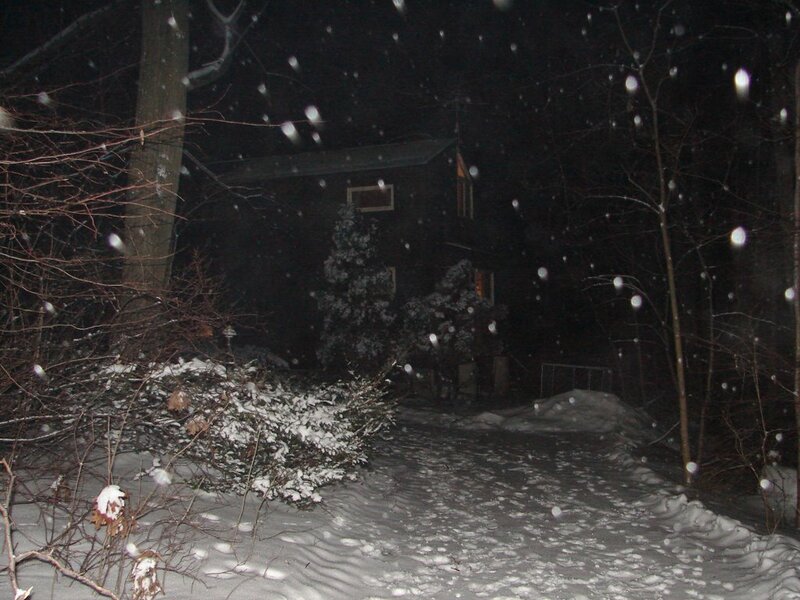 So out into the frigid night air I went, as the basement door is only accessed from the outside. Fortunately, this time the pipes opened up quickly but afterwards I never really fell back asleep soundly again. So the slight moderating of the temperature and especially the diminishing of that wind is most welcome. 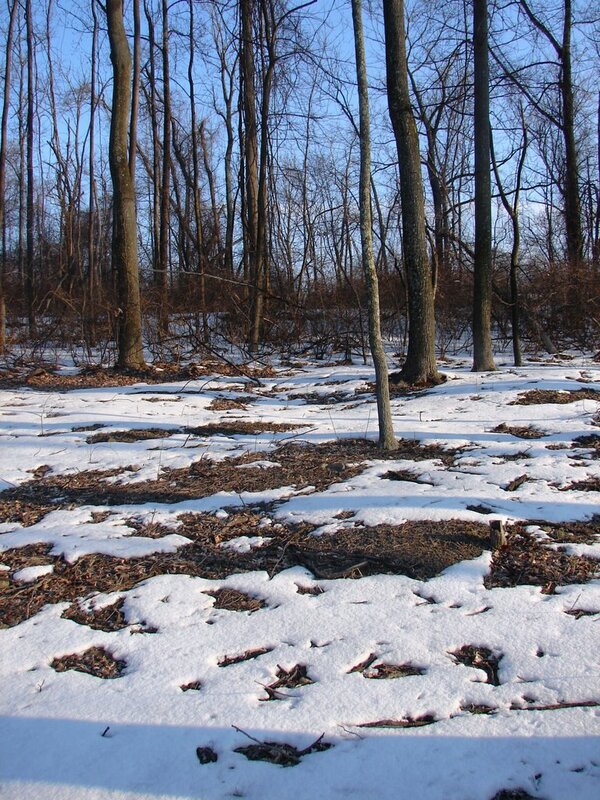 Overnight, a little more snow carpeted the woods again. It is soft and fluffy stuff with virtually no moisture. I broomed off the front deck, sending snowflakes high into the air with little effort on my part. It was -1° at the cabin this morning, with a brutal 15-20 mph wind. The forecast promises it won’t warm up very much for at least the next week. I don’t mind the temperature, though I could do without the wind. Readers of this blog must know by now that weather’s affect on the forest around me often creeps into my writing. So it should come as no surprise that I am often thinking about weather. So it was this morning as listened to the forecast. I know from that forecast that this spate of cold weather will persist for a week or so, but the coldest days are likely to be today and tomorrow. And then I thought about how recent that kind of information is. It’s only been 100 years or so that my area has had official forecasts and less time than that since computers and radar gave forecasters much information to create accurate forecasts from. So on this cold and windy morning, I got to thinking about what it must have been like, say 150 or so years ago, when people had no idea how long a cold spell would last. It must have been a great source of anxiety for them—would the wood last, would feed for the stock last, how long could they keep the water open? Here and now, I worry about the water pipes freezing too, but at least I have some idea how long I’m going to have keep the faucets dripping and when the weather will moderate. It wasn’t all that long ago that this information didn’t exist, and that’s a little hard, now, even to imagine. Snow is hard to come by this year. A little bit--less than an inch--fell on Friday, making that the biggest snowfall of the year so far. This lack of snow is a record lack and for me, not a welcome one. 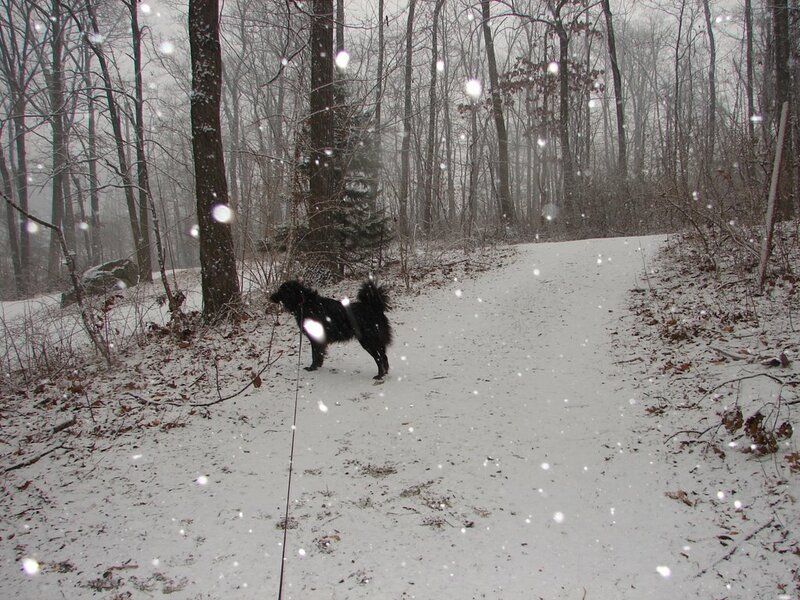 Baby Dog still found the start of the mini-snowfall a fun time. It's true that she isn't doing anything in this photo. That's because in the other photos I took she was always doing something that included running out of the photo frame. 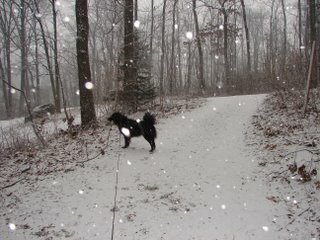 Since the snow, our walks have been short and not very sweet. The temperature has plummeted, now hovering only a few degrees above zero in the mornings, and the cold comes complete with 15-25 mph winds. As a result, we aren't spending a lot of time outside. I like cold weather, but not the windy part. Tonight, if I am lucky, I shoujld get the first accumulating snow of the season. In a normal year, I would yawn off the possibility of an inch or two of snow. But this is not a normal year, so I’m excited. 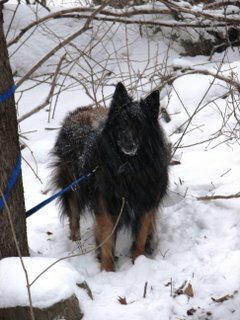 I’ve even planned a vacation day so I can run the dogs in the snow, take photos of it and just generally enjoy it. Okay, so I do have vacation days that I have to use or lose and it is a Friday, but still, I’ve been looking for some reason to take a day off, and this will be it. Last night the sky was already so overcast that the full moon was invisible, not even showing as a luminous bright spot behind the clouds. The night before, the nearly full moon was so bright that I cast a shadow as I walked in the darkened woods. Last night it smelled like snow, that crisp moist scent that's felt as much as sensed. I know snow is on the way. This morning I filled the birdfeeders as full as I could make them, in anticipation that my feeder birds will also sense the oncoming storm and feed heavily ahead of it. I wish I could stay home from work today and watch them. But I can't. Even that will have to wait for tomorrow.